One of Pakistan’s most renowned artists, Ali Sethi has been the pioneer in setting an immaculate record for conventional music in our country. In a time where various artists are branching out to experiment with modern music, Ali Sethi revives the roots of classical music with his melodious ghazals. With his latest song “Chandni Raat” that left audiences spellbound with his creativity, Sethi garnered colossal appreciation both and locally and internationally. Now this ‘Coke Studio’ star is all set to touch new heights and will be giving the concluding performance at this year’s Harvard Arts First Festival. This festival is the largest of its kind at any North American university and emphasises the creativeness and talent of students, faculty, alumni and other members of the Harvard community. Sethi graduated from Harvard in 2006 and went on to earn acclaim as a writer and musician. He is all set to sing poems by iconic South Asian Muslim poets that commemorate diversity, challenge bigotry and extol the virtues of love as fundamental to the human-divine relationship. 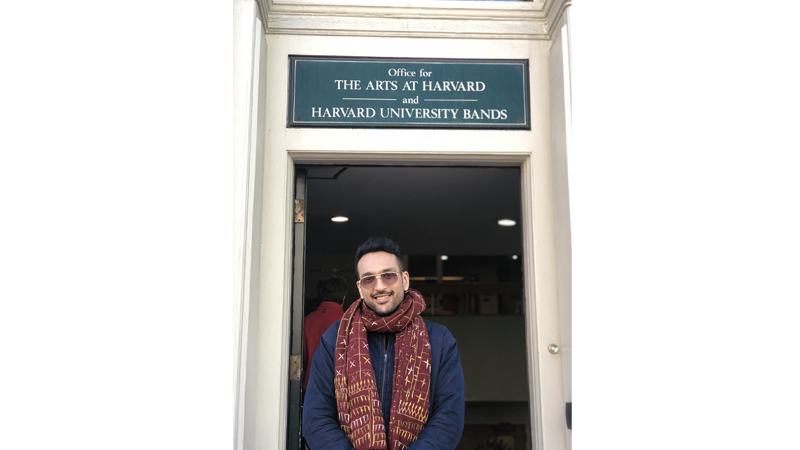 He’ll be performing at Harvard’s iconic Sanders Theatre and will be accompanied by his teacher and mentor Professor Ali Asani on stage during his performance. Grammy-winning music producer Noah Georgeson will also accompany him on stage. Being a student of Harvard, Sethi is always keen to take part in inspiring talks and concerts. Sethi is always eager to experiment with different musicians from all around the globe to bring a range of diversity to his work. Using various instruments and techniques in his songs has always been a distinct characteristic of him. Sethi and Professor Ali Asani who is the chair of Indo-Muslim & Islamic Religion & Cultures have been collaborating since Sethi was a student. During his courses on religion and the arts in Muslim cultures, Sethi got to explore various new things. This latest collaboration that Sethi and his professor are doing, The Covenant of Love, mainly highlights poetic rituals that have historically played a crucial part in influencing Muslim worldviews. It further focuses on how these views have unfortunately been disregarded in contemporary discourses about Islam. Sethi has been a breath of fresh air for our music industry and has always turned to Sufi poems in times of distress. This beautiful collaboration that Sethi will be doing with his group for the Harvard Art Festival carries the essential message of love. It aims to open up our hearts to the beauty of each other, the discrete affluence of diverse convictions and cultural traditions. It emphasises on and the extravagant prospects of music, poetry and art that can construct such a transformation in the world. In a time were the world is hurting it is imperative to see and consider this beautiful message symbolised in as many ways as possible. Seeing Sethi represent aspects of our culture that the world will perceive in a different light is definitely a proud moment for the entire nation. Sethi will perform at Harvard on May 5, 2019, the concluding event of the four-day festival.